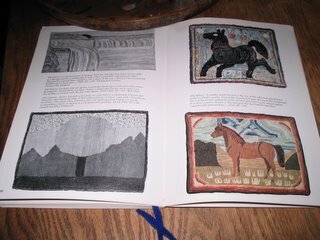 After a discussion with a member of Rughookers, I thought it might be appropriate for me to share my opinion of some books about rughooking. 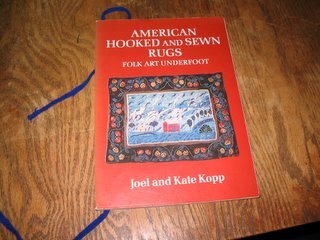 The book I recommend most to beginning hookers is Joel and Kate Kopp's American Hooked and Sewn Rugs, Folk Art Underfoot. First published in 1975, it has the best collection of pictures of antique rugs available. Many of the patterns sold as "antique" or "adapted from an antique" by professional designers are actually patterns made from the rugs in the Kopp book. It is the kind of book that can put a rughooker in a state of primitive rug euphoria. 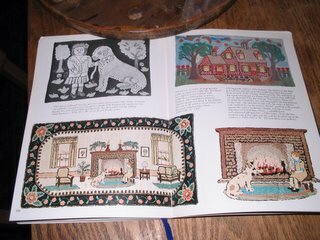 It is readily available in paperback in a 1995 reprint - which is larger and probably a little more attractive than the original edition.